"Einmal sehen ist besser als hundertmal hören". 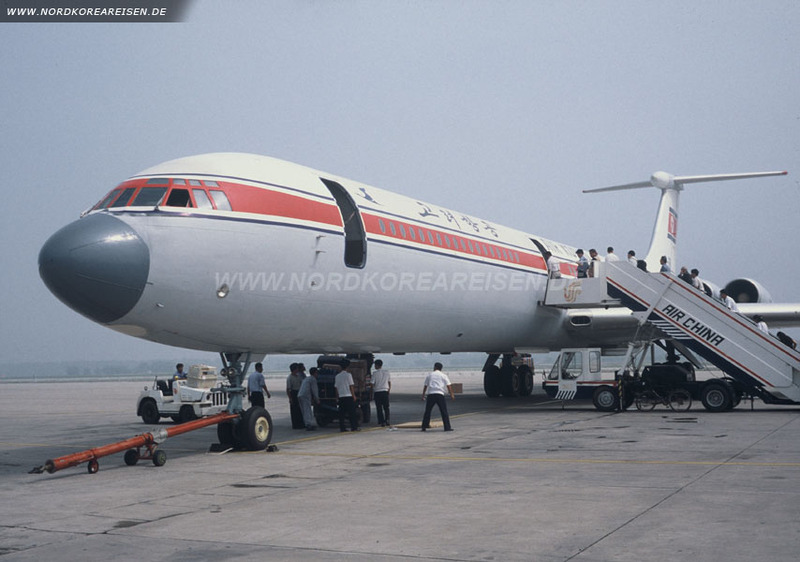 Pyongyang - "the cradle of Korean culture"
Passengers look out full of expectation and anticipation onto the airfield where the IL 62 of the North Korean airline Air Koryo has just landed gently on its arrival from Beijing. “Arirang”, the traditional Korean song of welcome, sounds out from the loudspeakers. Attentive stewardesses in white gloves accompany the new arrivals to passport control and customs, where all the procedures are carried out quickly and smoothly. After that, the foreign guests, whether travelling as individuals or as members of a group, are received by their respective Korean interpreters, drivers and guides, who will accompany them throughout their stay. Pyongyang straddles the River Taedong (the "River of Great Harmony"), on whose banks people settled as long as 3,000 years ago. Broad boulevards lead to the monumental Triumphal Arch, bigger than the one in Paris, that marks the entrance to the city centre proper. Visitors from abroad generally stay at the 45-storey Koryo Hotel, or at the new Yanggakdo Hotel, which stands on an island in the middle of the River Taedong. Both of these hotels offer a high standard of comfort, including their own swimming baths. 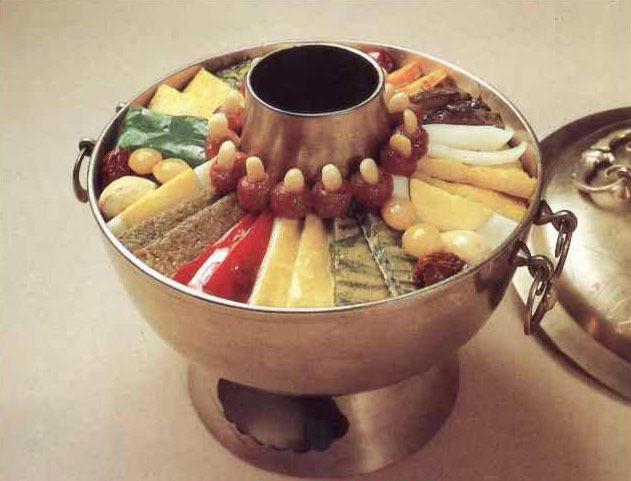 Visitors are often surprised when they first make their acquaintance with Korean cuisine: a wide range of dishes, spicily seasoned and tastefully presented. In the evening the blazing red artificial torch on top of the 170-metre-high, obelisk-like Juche Tower, one of North Korea’s most prominent landmarks, can be seen in the distance. 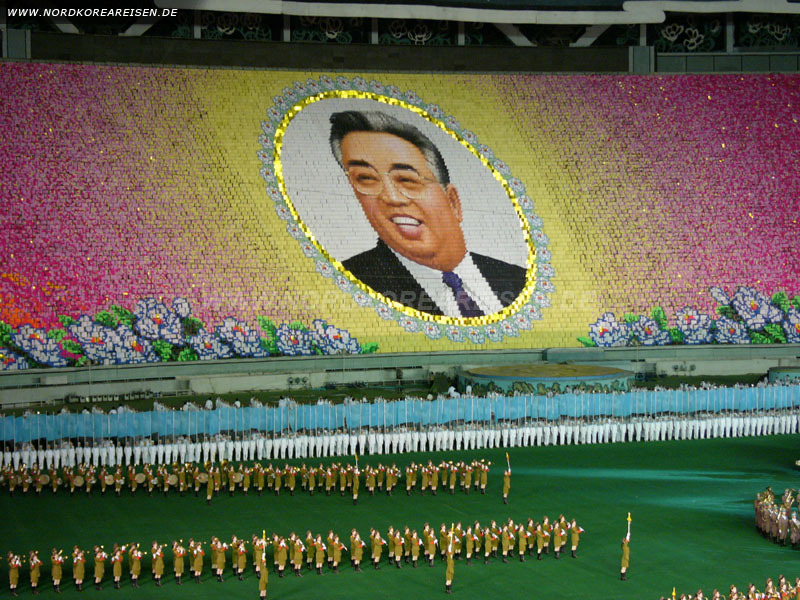 As evening entertainment, Pyongyang can offer concerts, the theatre or the circus, a very modern bowling alley or Korean television, whose two channels mainly broadcast nature, documentary or feature films of their own production (together with India, North Korea is one of the biggest film-making countries in Asia). On the following day, the programme generally provides for an extensive coach tour of the city; visitors who are interested in particular topics can request these in advance. 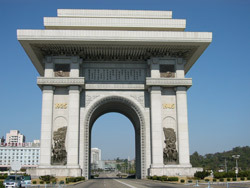 The city tour features a series of architectural superlatives: the Grand People’s Study House, the Pyongyang Grand Theatre, the Palace of Culture (all these major buildings being tastefully designed in a manner reminiscent of traditional Korean architecture), the Mansudae Grand Monument with the impressive bronze statue of the country’s founder and long-time leader Kim Il Sung, and a trip on the Metro, whose stations with their gigantic mosaics resemble underground palaces. All these have been built since the Korean War, during which the city was almost totally destroyed. Visitors will also remember the smart lady traffic police, who briskly direct the small volume of traffic, the pedestrians obediently using the subways to cross the streets, and the Korean music that is to be heard in the well-kept parks and green areas: everywhere, there is a feeling of great orderliness and cleanliness, and of a life that appears to be free of stress. In the course of a leisurely walk around the pavilions, city gates and other historical relics on Moran Hill, visitors can enjoy magnificent panoramic views out over the city. It is possible to go for a walk on your own initiative, but you should consult with your tour guide before doing so. Visits to department stores and food shops will give the visitor an objective picture of the range of goods on offer. There are also specialist shops such as opticians’, music shops, special shops for stamp collectors and numerous bookshops. Nowhere will visitors find so much literature and so many picture-books in a variety of foreign languages as in Pyongyang; even postcards printed in the common international languages are available. 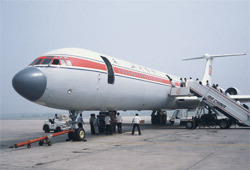 When planning an itinerary, visitors are advised to plan in visits to factories and educational institutions, in order to obtain a better understanding of modern life in Korea; in particular, a visit to the Children’s Palace, where schoolchildren take part in numerous working groups in the afternoons, making things, making music (every child in North Korea plays an instrument), doing sport or pursuing other leisure activities, will be an unforgettable experience. One excursion that is very much to be recommended leads in a southerly and south-westerly direction along the broad River Taedong to Nampo on the coast of the West Sea, as the Yellow Sea is known in Korea. Here is to be found the impressive West Sea Barrage, a 13-km-long dam incorporating a system of locks and sluices. It is also possible to take a break for a bathe. Passing by picturesque Mount Kuwol one reaches Kaesong, North Korea’s most southerly city, which is famous above all for its beautiful Old Town and the Koryo Museum, and from where excursions can be made to the royal tombs of Kings Kongmin and Wanggon. In Kaesong the foreign visitor can stay at the traditional Folk Hotel, where both the restaurant (classic Korean cuisine) and the bedrooms are on ground level and it is possible to meet for pleasant chats in the secluded inner courtyards of the guesthouses. Next day the journey continues to the Demarcation Line in the Demilitarised Zone. The motorway leads almost directly to the frontier; a sign "Seoul 45 km" reminds the visitor of the far-reaching consequences of the division of the Korean nation, which has lasted for some 55 years now. Only from the northern side is it possible, accompanied by press officers, to visit the historic building in which the armistice agreement was signed. 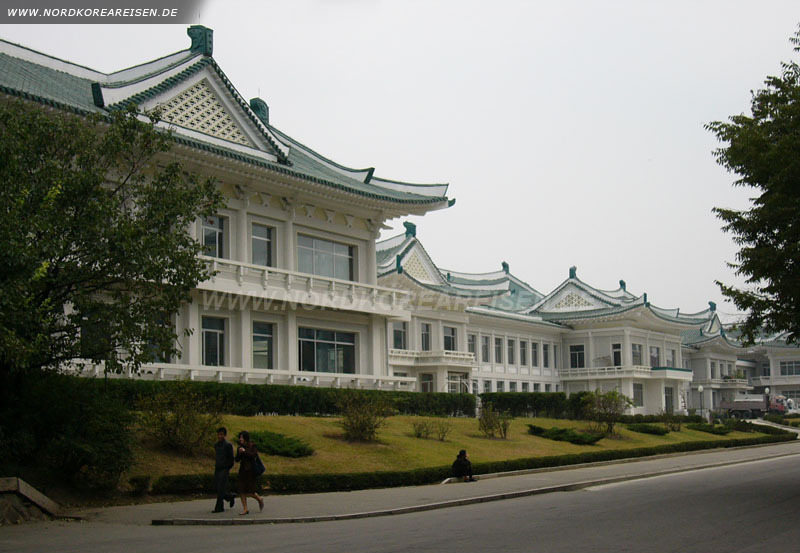 In the nearby border town of Panmunjom a visit is paid to the world-famous Conference Room, where negotiations between the two sides still take place; it has a northern and a southern entrance, and the provisional border passes through the centre of the table, marked by microphone cables. On some days visitors from the northern side have access to the Conference Room, on others visitors from the southern side. Visitors coming from the North must expect to be extensively photographed by the Americans and South Koreans. 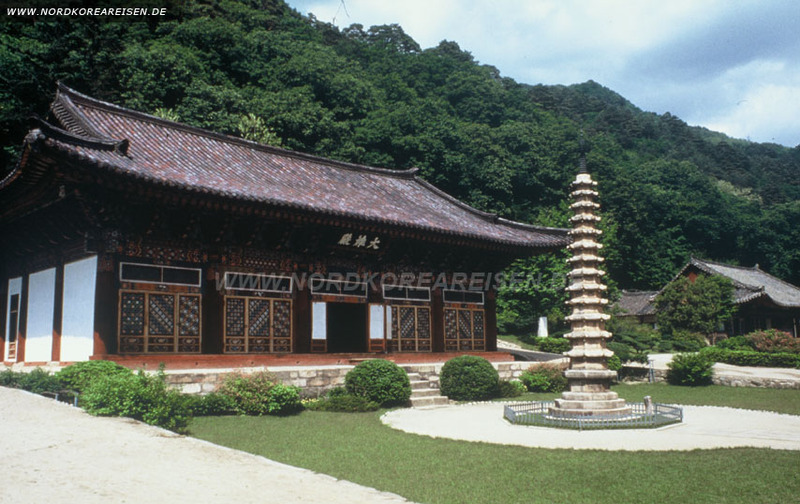 Apart from the delightful natural surroundings of roaring waterfalls and mountain streams, pleasant valleys with little pavilions and the Pohyon Temple, which is around 1,000 years old, visitors are particularly taken by the museum housing the "International Friendship Exhibition", which is built in traditional Korean style. 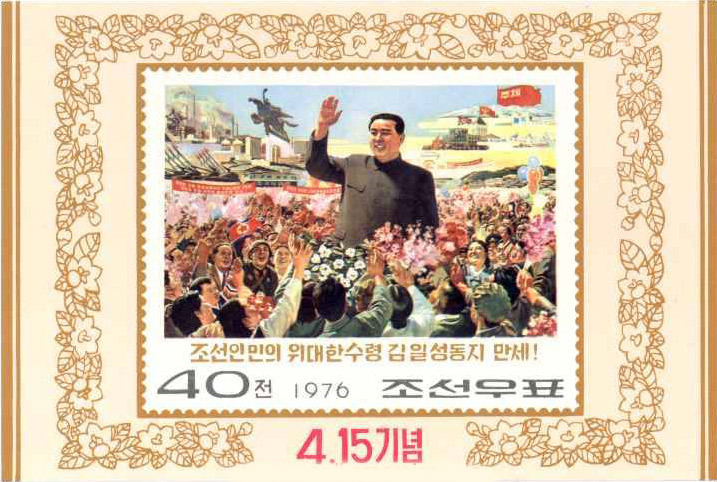 On show here is a unique collection of gifts presented to Kim Il Sung and his son and successor Kim Jong Il by state visitors, including Meissen porcelain presented by Erich Honecker, bullet-proof limousines from Joseph Stalin, crystal vessels from Jimmy Carter and a collection of masterpieces of Chinese art presented by Mao Zedong and Zhou Enlai. Rambling, trekking and mountain climbing: it is perfectly possible to pursue all these activities in North Korea. 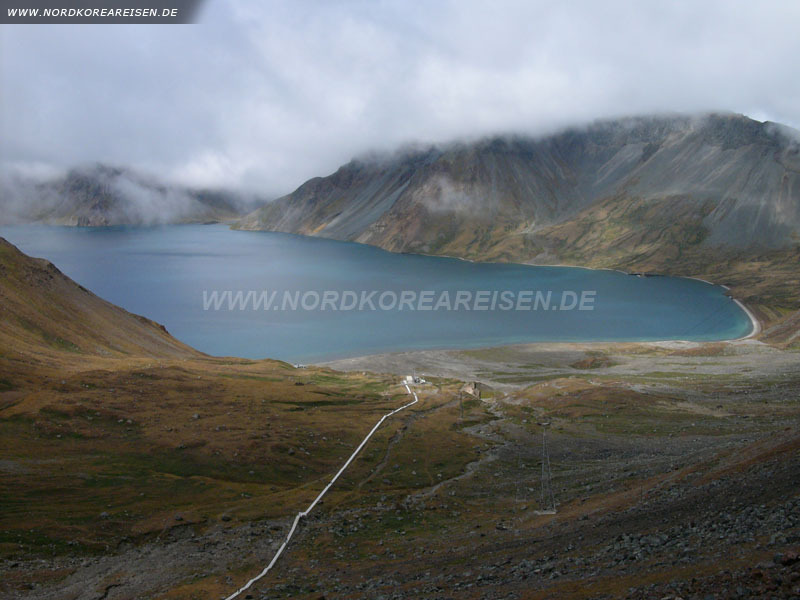 The volcano Mount Paektu, lying in the extreme north, is venerated as a holy mountain throughout Korea; it lies among enchanting unspoilt scenery with deep forests reminiscent of the Siberian taiga. The highlights of the area are the rare plants, the monuments and places of remembrance commemorating the struggle against the occupying Japanese, and a crystal-clear crater lake. 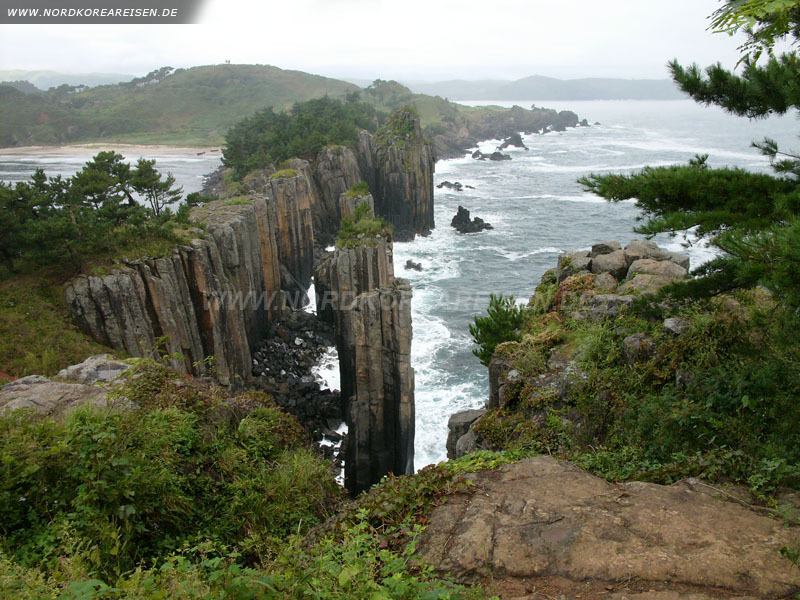 The Chilbo Mountains have only recently been made accessible to tourists, and are notable for their impressively bizarre rock and erosion landforms, which run down into the East Sea (the Sea of Japan). 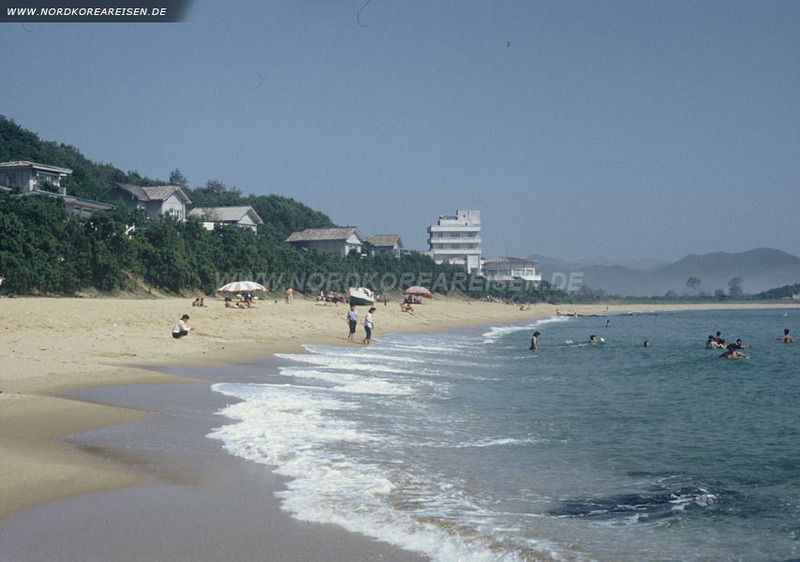 The Kumgang Mountains ("Diamond Mountains") are divided into the Inner, Outer and Sea Kumgang, the last-named boasting such scenic and artistic highlights as the Phyohun and Jongyang Temples and the walk to the Podok Hermitage, passing Buddhist rock sculptures on the way.